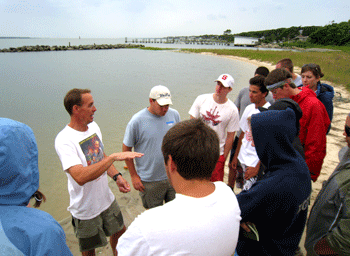 Dr. Jeff Buckel speaks with visitors to CMAST about estuarine ecology. The fisheries ecology group addresses the question, “What causes populations of fish to vary in size?”. Increases in population size result from production of young fish which we refer to as ‘recruitment’. Decreases in population size can result from natural causes of death such as a bigger fish eating a smaller fish or rapid drops in water temperature; deaths from fishing also decrease fish population size. To measure these ‘vital’ rates (recruitment and death), we use a variety of approaches such as sampling fish with nets, tagging fish with external marks, monitoring fish with electronic pingers, determining what fish eat, and modeling fish populations. We cooperate with commercial and recreational fishermen and other scientists in state and federal fisheries management agencies to ensure research success and relevance. The program is made up of multiple faculty (Aday, Buckel, Hightower, and Rice) from the Department of Zoology. Dr. Jeff Buckel, a resident faculty, conducts applied and basic research with a group of graduate students, research assistants, and post-graduate fellows. Collaborators include the North Carolina Division of Marine Fisheries, NOAA’s Beaufort Laboratory, University of North Carolina at Wilmington, University of Massachusetts, SUNY Stony Brook, University of Maryland, and Rutgers University. Dr. Jeff Buckel serves on NC Marine Fishery Commission advisory boards and the South Atlantic Fishery Management Council’s Science and Statistical Committee. 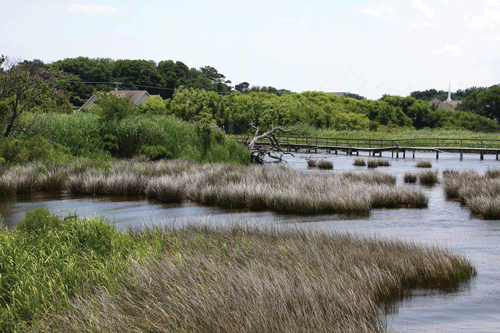 Research from the Marine and Estuarine Fisheries Ecology group has been used in state and federal fishery and habitat management plans. Additionally, personnel from the group give presentations to K-12 students, recreational fishing clubs, commercial fishing groups, and high school instructors.